Until humanity makes contact with some genuine extra-terrestrials, the aliens we invent will say more about us than about them. By extension, the same goes for where we first encounter these imaginary off-worlders. These maps show the locations of alien first contacts on Earth in almost a century of popular films, from Algol (1920), a Faust-from-outer-space parable made in Weimar Germany; to Annihilation (2018), a reflection on America's loss of faith in the future of humankind. The rules: Each dot shows the first appearance of (outer-space) aliens at specific locations in films. Excluded: Inter-dimensional aliens and global alien invasions (hence no War of the Worlds). Alien landings in the U.S. If the maps are anything to go by, ET will flock to the U.S., and preferably to places with well-established movie industries: Los Angeles and New York, mainly. Don't do it, guys – you'll just end up waiting tables! A few other locales seem to attract more than their average share of UFO landings: The Bay Area, certain parts of the Southwest (Arizona and New Mexico), the Midwest (Chicagoland and Ohio), and the South (particularly Alabama and Florida). Unsurprisingly, California is the most ET-friendly state (14 landings), followed by New York (7) and Illinois (5). Some parts of the U.S. remain curiously alien-free. The Pacific Northwest, for example. Well, who ever heard of an alien craft landing in rain? If it weren't for two sightings in Montana and Wyoming each, that no-UFO zone would extend all the way to Minnesota. New England is also virtually extra-terrestrial-less, as is that row of states just west of the Mississippi. The mapmaker has kindly provided dates for each movie, which tells us something about the peaks and troughs of alien-landing excitement in the U.S. It all started so well in the 1950s, with six touchdowns – and then none in the 1960s. Things picked up slightly in the 1970s, with 5 first-contact films. Close Encounters of the Third Kind (1977) inspired a lot of what came after. The 1980s were the Golden Age of Alien First Contacts. The first and perhaps most influential one was Spielberg's ET, the Extraterrestrial (1982). 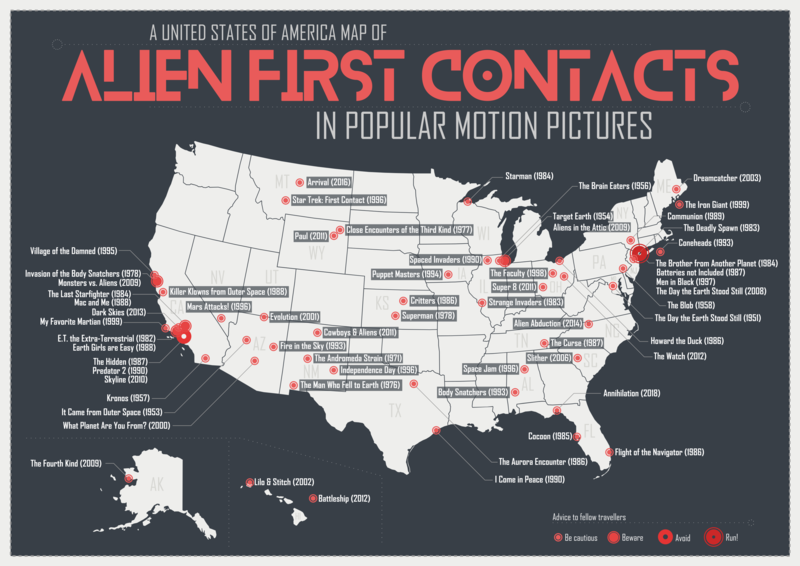 In all, the map shows no less than 19 first-contact films from this decade. After the long climax, a slow decline: 15 landings in the 1990s, 10 in the 2000s and 9 in the 2010s. Even if the U.S. gets preferential treatment, it doesn't have exclusive rights to alien first contacts. As this map shows, UFOs do land in other parts of the world as well. One particular invasion is more 'globalist' than others. The aliens in Arrival (2016) touched down in Montana, Russia, Pakistan, Greenland, China, Sudan and Venezuela, among other places. That's how they do 'Shock and Awe' on Rigel 5. In general, however, non-American aliens are more discriminating in their choice of landing locations. They have a strong preference for London, the rest of the UK and western Europe (in that order, but keep in mind this is pre-Brexit) over the rest of the world. Mind you, being a rest-of-the-worlder could be a good thing. As this map also indicates, the aliens' intentions aren't always benevolent. Take for instance Grabbers (2012), the only film set in Ireland that made it onto the map, and providing what may be a uniquely Irish take on the genre. The movie features human-eating monsters which fortunately prove allergic to high blood-alcohol levels. In order to survive the attack, the townspeople have to get drunk in the local pub. With the exception of two Arrival landings, two first contacts in Egypt (Stargate, 1994; and The Fifth Element, 1997), and two South African ones (Nukie, 1987 – set in Kenya; and District 9, 2009), aliens stay clear of the Mother Continent. This despite the rich seam of African sci-fi usually grouped under the header 'Afrofuturism'. Latin America doesn't fare much better, with the exception of Mexico. A charming example is La Nave de los Monstruos (1960), which tells of an expedition from Venus to recruit males to help repopulate their all-female planet. The titular ship is filled with male 'monsters' from all corners of the galaxy. On Earth, the Venusian crew fall for Lauriano, a singing Mexican cowboy. Mexico's sci-fi production also includes The Incredible Invasion (1971), a low-budget flick featuring Boris Karloff, set in 1890s Germany. Science fiction was big in Soviet times, but only First Spaceship on Venus (1960) and This Merry Planet (1973) get a mention here. In the latter movie, an alien delegation lands in the middle of a New Year's costume party in a Soviet House of Culture. They fail to convince anyone of their extra-terrestrial origin. When the clock strikes midnight, they realize they've landed on the most beautiful planet in the universe (and, as is undoubtedly implied, the country with the best ideological system on that planet). One of the most remarkable post-Soviet sci-fi movies is Abdullajon (1991), judged by many to be the greatest film ever made in post-USSR Uzbekistan, as well as (probably) the only sci-fi one. A local Uzbek farmer discovers a crash-landed alien – a white boy – when looking for a lost cow. Dubbed Abdullajon, the alien can perform miracles, but doesn't always understand his hosts. When asked to produce 'big money', he fashions a giant one-ruble coin, for example. He does succeed in making the hens lay 50 eggs per minute, though. The alien manages to escape back to space before the Russian Army captures him. 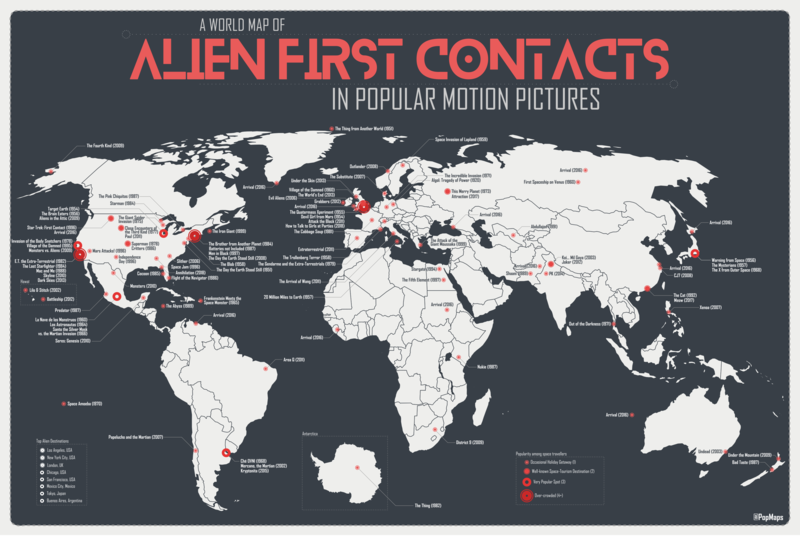 Looking at the dates for first-contact movies set outside the U.S., there is a definite trend: Back in the 1950s and 1960s, aliens most often landed in Europe, Japan and Mexico. From the 1970s to the early 2000s, the U.S. hogs the scene. But then, ET starts visiting other places, including non-western ones, such as India, China, the Philippines. Unless and until the first real extra-terrestrial lands, the future of alien first-contact movies could very well be Asian. Meanwhile, I've got to check out what must be Greece's definitive contribution to the genre: Attack of the Giant Moussaka (1999). Many thanks to Dylan_Mq for providing these maps. He describes himself as a "DataViz, Map and Pop Culture enthusiast (who creates) maps & designs about things I like". Find them on Reddit, Twitter and Etsy.